Purpose - A low-cost, open source, self-replicating rapid prototyper (RepRap) has been developed, which greatly expands the potential user base of rapid prototypers. 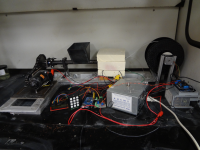 The operating cost of the RepRap can be further reduced using waste polymers as feedstock. Centralized recycling of polymers is often uneconomic and energy intensive due to transportation embodied energy. This paper provides a proof of concept for high-value recycling of waste polymers at distributed creation sites. Design/methodology/approach - Previous designs of waste plastic extruders (also known as RecycleBots) were evaluated using a weighted evaluation matrix. An updated design was completed and the description and analysis of the design is presented including component summary, testing procedures, a basic life cycle analysis and extrusion results. The filament was tested for consistency of density and diameter while quantifying electricity consumption. Findings - Filament was successfully extruded at an average rate of 90 mm/min and used to print parts. The filament averaged 2.805±0.003mm diameter with 87% of samples between 2.540± 0.003mm and 3.081± 0.003mm. The average mass was 0.564 ± 0.001 g/100mm length. Energy use was 0.06 kWh/m. Practical implications - The success of the Recyclebot further reduces RepRap operating costs, which enables distributed in-home, value added, plastic recycling. This has implications for municipal waste management programs as in-home recycling could reduce cost and greenhouse gas emissions associated with waste collection and transportation as well as the environmental impact of manufacturing custom plastic parts. 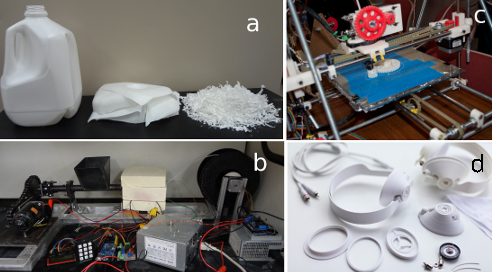 Originality/value - This paper reports on the first technical evaluation of a feedstock filament for the RepRap from waste plastic material made in a distributed recycling device. Although the environmental benefits of recycling plastics are well established and most geographic locations within the U.S. offer some plastic recycling, recycling rates are often low. Low recycling rates are often observed in conventional centralized recycling plants due to the challenge of collection and transportation for high-volume low-weight polymers. The recycling rates decline further when low population density, rural and relatively isolated communities are investigated because of the distance to recycling centers makes recycling difficult and both economically and energetically inefficient. The recent development of a class of open source hardware tools (e.g. RecycleBots) able to convert post-consumer plastic waste to polymer filament for 3-D printing offer a means to increase recycling rates by enabling distributed recycling. In addition, to reducing the amount of plastic disposed of in landfills, distributed recycling may also provide low-income families a means to supplement their income with domestic production of small plastic goods. This study investigates the environmental impacts of polymer recycling. A life-cycle analysis (LCA) for centralized plastic recycling is compared to the implementation of distributed recycling in rural areas. Environmental impact of both recycling scenarios is quantified in terms of energy use per unit mass of recycled plastic. A sensitivity analysis is used to determine the environmental impacts of both systems as a function of distance to recycling centers. The results of this LCA study indicate that distributed recycling of HDPE for rural regions is energetically favorable to either using virgin resin or conventional recycling processes. This study indicates that the technical progress in solar photovoltaic devices, open-source 3-D printing and polymer filament extrusion have made distributed polymer recycling and upcycling technically viable. This page was last modified on 3 January 2019, at 09:36.